This shelf just begged to be photographed this morning. I mean just look at it! The light was right, the yarn was shining in all it's glory and the camera was right next to me. All that was missing was a cup of tea to sip on while admiring this! This is the shelf with most of my Duke Silk Yarn. Just realized I haven't listed the tan ones near the center! Note to self - also put up better pictures of the blue, the green and the lavender ones in the store listings. I mean just look at them! 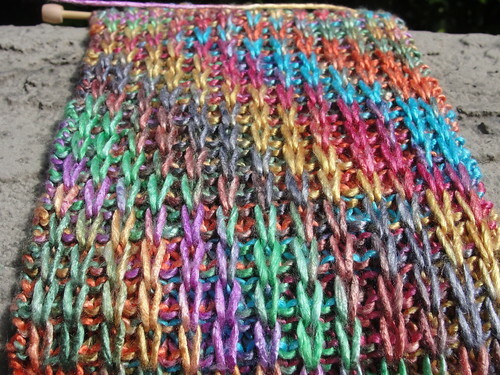 The multicolored one was used to make the scarf in the picture below and the yarn I used to make the shawl in this blog post is on a different shelf. Also my stitch markers, (yeah I've completely forgotten about them as well) were featured in this pretty Purple and Red treasury today.